T-Cut Color Fast Scratch Remover is an innovative product that removes scratches and blemishes, whilst bringing back the original depth of colour in one simple application. T-Cut technology is enhanced by nano particles that allow for easy application with excellent results. Colour pigments work with all shades of given colour. 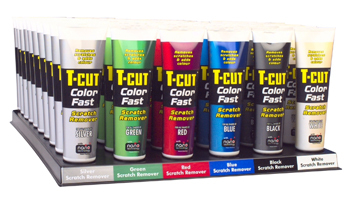 Hide those scratches and scuff marks with the T-Cut Colour Fast Remover. Easy to add in one easy application, this scratch remover will restore your paintwork to its former glory. This entry was posted in Uncategorized and tagged colour fast, duco, restore paintwork, Scratches, t-cut, tcut. Bookmark the permalink.